Innovative tech-driven solutions have become a must in today’s world of digitization. The burgeoning ad-tech industry plays a vital role in this respect. However, the ad-tech consists of many buzzwords. One such word is “Remarketing”. 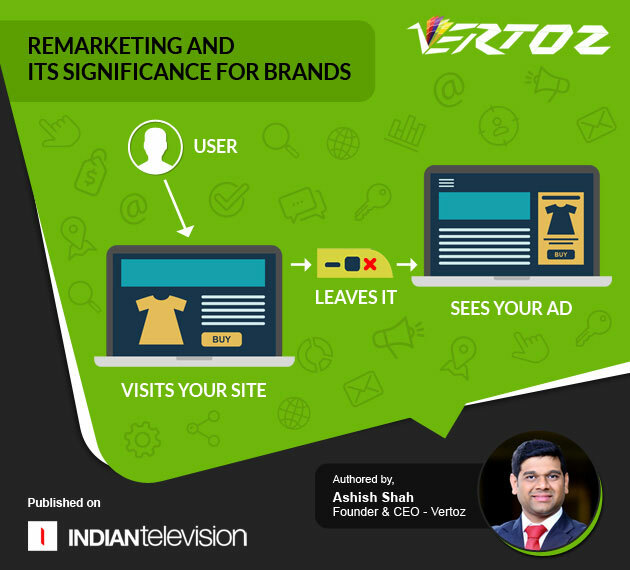 Recently, Vertoz’s Founder and CEO, Ashish Shah, was in a brief interaction with IndianTelevision, discussing what exactly is remarketing and how it benefits the brands. Remarketing is a technique used to identify and target those specific customers who have visited the brands’ website but may not have made an immediate inquiry or purchase. They are more likely to make a purchase later and hence, should not be left out. However, Ashish says that remarketing is not just limited to retargeting, but also plays a major role in customer retention. Acquiring new customers is 7x costlier than retaining the existing ones. Hence, remarketing is used profusely today in the e-commerce sector. upcoming EU General Data Protection Regulation (GDPR), which can make tracking customers’ personal data very tricky. Hence, this needs to be tackled carefully post-GDPR. Remarketing has a range of benefits like increasing conversion rates, being a cost-effective way of reaching out to the customers, offering a better brand recall and ROI. Not just this, brands can even target their competitors’ visitors using remarketing. Remarketing is highly effective and gives great returns. Hence, it is highly recommended that brands make it an integral part of their marketing and advertising strategies. To read the detailed article, click here.